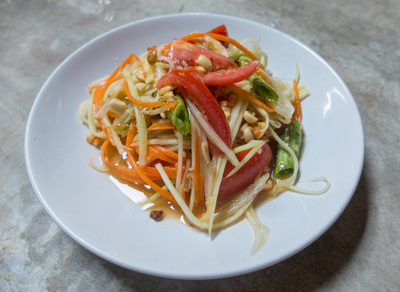 Som Tum is a spicy salad made from shredded unripe papaya (similar dishes exist with unripe mango or cucumber as main ingredient). It is a very tasty dish as it combines the five main tastes of the local cuisine: sour lime, hot chili, salty, savory fish sauce, and sweetness added by palm sugar. There is also a milder version of the papaya salad (made for tourists mostly) where number of chilies used is significantly lower than the traditional recipe. 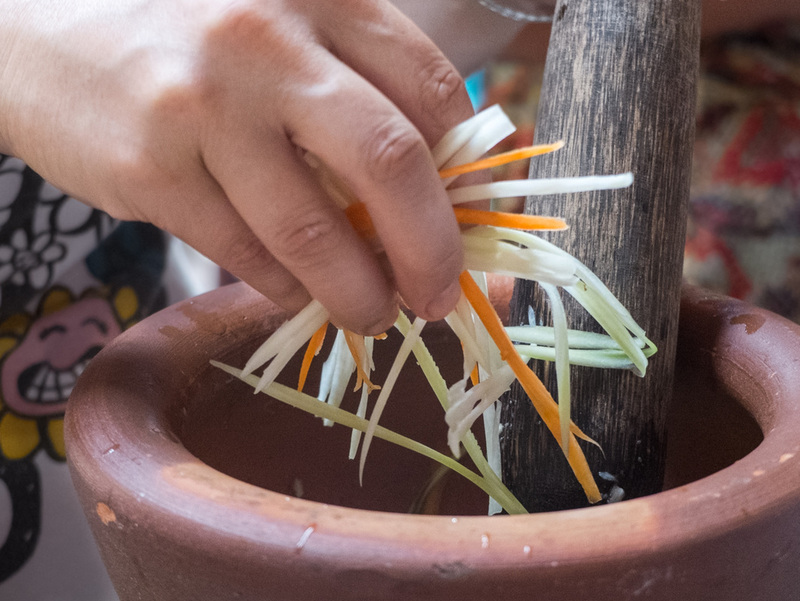 Traditionally in Thailand, tom sum is often served with sticky rice and grilled chicken. Green papaya salad is a delicious and light lunch, perfect for a sultry summer day. Peel the papaya and carrot, and cut them julienne style. Pound garlic and chillies coarsely in a mortar. 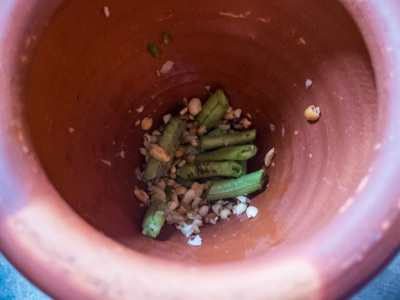 Add the cut snake beans (small pieces of 2 cm in length) and a handful of roasted peanuts and gently pound all the ingredients. 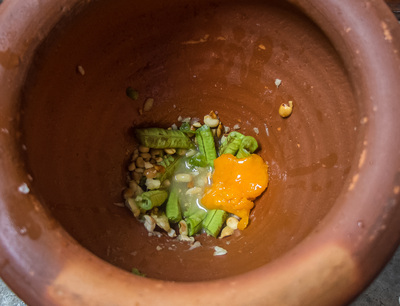 Then add the lime juice, fish sauce and palm sugar and toss well to combine before adding the papaya and carrot. 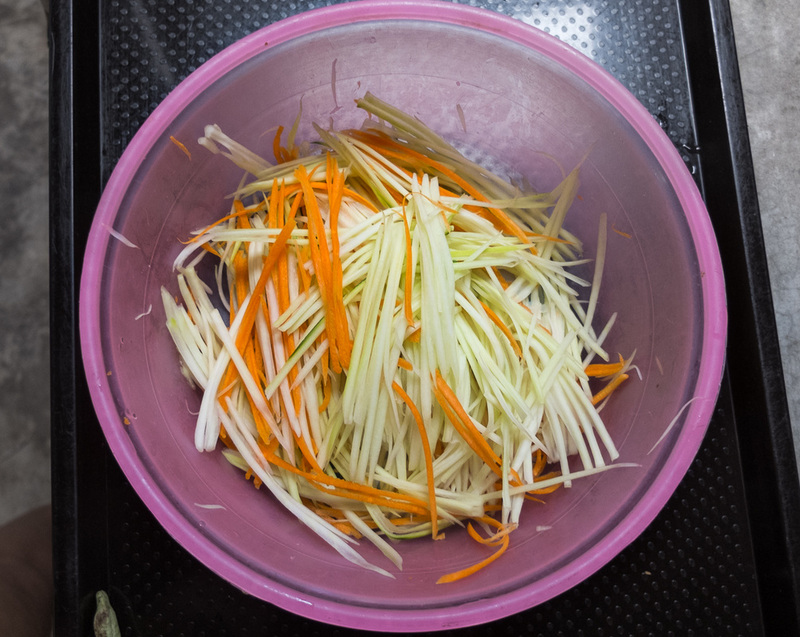 Add shredded papaya and carrot, and pound gently with the pestle until evenly mixed. At the end, add the sliced tomato and the dried shrimp, and give it all a final toss. Serve with a plate of white cabbage, green beans and Thai basil. 5. our delicious Som Tum is ready! 1. Palm sugar can be replaced with brown sugar (which, however, is a little less sweet) or a wildflower honey. 2. The amount of garlic and hot peppers can vary according to taste. The original version is pretty spicy, so for those who like it, you can also use 3-4 chillies per portion. Do not overdo it with the garlic though, as it tends to cover other flavors too. 3. 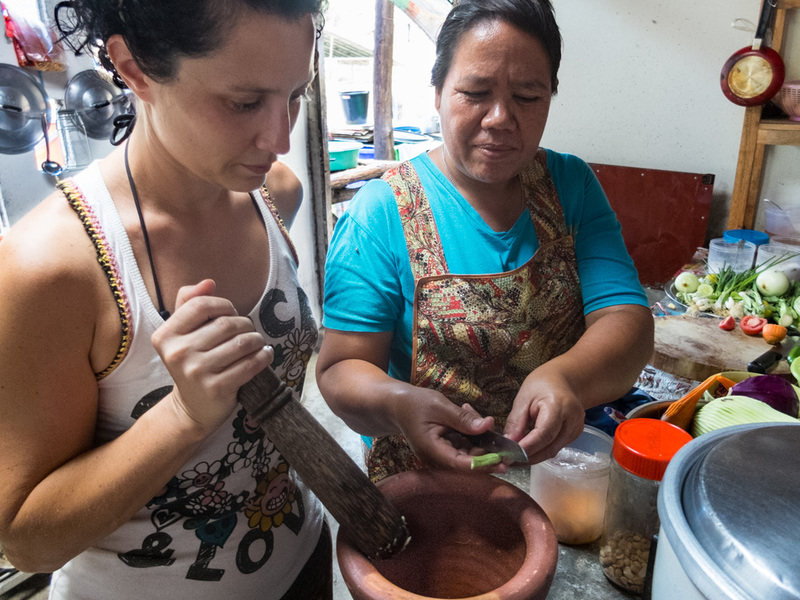 The trick is to work with the pestle constantly but gently during the preparation and simultaneously stir with a spoon. This way papaya will soften without getting mushy!